Dr. Robert Krell, left, listens to Prof. Elie Wiesel, as Wiesel addresses the capacity crowd that came to the Orpheum in 2012 to hear him speak (photo by Jennifer Houghton). Elie Wiesel passed away on July 2. May his memory be for a blessing. Wiesel was in Vancouver to launch the Jewish Federation of Greater Vancouver’s annual campaign on Monday, Sept. 10. 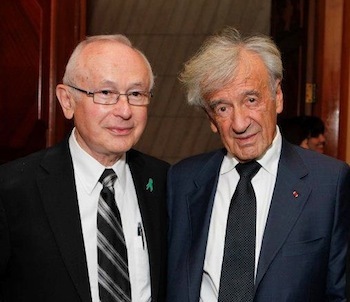 The event, which was held at the Orpheum, featured Wiesel in conversation with his friend, fellow survivor Dr. Robert Krell, as well as a presentation of another of Wiesel’s friends, Robbie Waisman, who accompanied this year’s March of the Living program to Poland and Israel. Participant Jenna Brewer read the account written by Monique de St. Croix of Waisman’s emotional return to his birthplace, after which Waisman himself addressed the nearly 2,700 people in attendance. 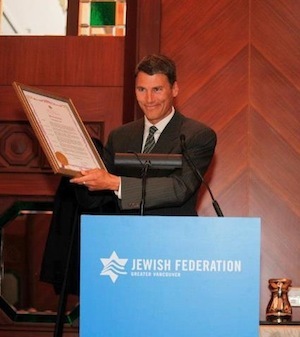 The campaign launch was the culmination of Wiesel’s day here, which included a proclamation from Vancouver Mayor Gregor Robertson declaring Sept. 10, 2012, Elie Wiesel Day. Among Wiesel’s many activities was the receipt of an honorary degree from the University of British Columbia, where he spoke to university administrators, students and Holocaust survivors. A formal academic procession led Wiesel into the hall and a short panel discussion followed his remarks, involving the university’s president, Prof. Stephen Toope, Prof. Richard Menkis, a professor of modern Jewish history, and Barbara Schober, a graduate student. UBC Chancellor Sarah Morgan-Silvester presented Wiesel with the doctorate. Also on Wiesel’s itinerary was a morning interview with the Jewish Independent; one of only two interviews he granted while here, the other being with the Vancouver Sun. As editor Basya Laye and I introduced ourselves, Wiesel admitted his dependence on the New York Times, a copy of which he had not yet picked up that day. Once the “bible of journalism,” according to Wiesel, he lamented the Times’ decline in quality as the newspaper industry itself has declined. He wasn’t worried about the change to internet media, however. Wiesel recounted how, years ago, he complained to the Times about how little there was in the paper about the Holocaust while it was happening. Subsequently, he was invited to a luncheon, at which he gave them a piece of his mind. As a result, said Wiesel, in the paper’s offices, they have a plaque/letter saying, “We failed,” as a reminder to themselves. Yet, admission of failure on the world level – that countries did not do enough to prevent the Holocaust – has not resulted in the prevention of other attempts at genocide. For his part, Wiesel has spent most of his life – as a witness, storyteller and teacher – trying to ensure that “never again” is a promise kept. Born in Sighet, Romania (which was in Hungary during the war), Wiesel was 15 when he and his family were taken to Auschwitz. His mother and younger sister were killed there, his father died in Buchenwald, where Wiesel also was imprisoned when the war ended; his two older sisters survived. Wiesel’s book about his experiences in the camps, Night, was first published in 1956. It has since been translated into more than 30 languages, with millions of copies being sold. A professor at Boston University since 1976, Wiesel was founding chair of the United States Holocaust Memorial Council, which created the U.S. Holocaust Memorial Museum, and, with his wife, Marion, he established the Elie Wiesel Foundation for Humanity soon after he received the Nobel. He has written more than 50 books, and his lengthy resumé continues. Complementing his activism for human rights, Wiesel is a dedicated student of Talmud and has a deep appreciation of Chassidic and biblical stories, which the Independent referred to as “old” in asking a question about such stories’ relevance today. Wiesel explained, “There is so much beauty in all that. There is so much….” He paused. “Truth is a difficult word because my truth may be mine, but not yours, but learning, the quest for truth, is extraordinary. For me to teach those texts is so rewarding, so rewarding. And we take a theme, a talmudic theme or a biblical theme or a prophetic theme, and it can go on, it can last for us for hours and hours and hours in class. The concept of truth came up again when the Independent asked Wiesel’s opinion – as a former journalist himself – about how much a newspaper should reflect extremes within the community it serves. Despite having wondered aloud as to the effectiveness of his efforts to change the world, Wiesel still gets up every morning to do just that. “What is the alternative?” he asked rhetorically. “What is the alternative? There is no alternative. True, I fought many battles and lost. So what? I’ll continue fighting. Look, my life is not a life of success or victory, much more of failures. I tried so many things and failed, you have no idea. Of course, so what? I’ll continue. The only area where I feel I must continue is, first of all, education. Whatever must be done in Jewish life, and in life in general – not only for Jews – education must be a priority. Not the only one, but the main priority, education. Let’s surely aim for that. And then, Israel, to me, of course is – the centrality of Israel in my life is here,” he said, putting his hand over his heart. A few moments later in the conversation, Wiesel returned to the topic of journalism.